Few air purifier brand names spark interest today quite like Rabbit Air. Their units offer proven filters, and safe ionizers (CARB Certified). They also blend into almost any home’s decor thanks to a sleek but simple exterior. The Rabbit Air MinusA2 is one of the company’s best selling designs. It offers everything you’d expect from Rabbit Air, along with a ton customization options. One of the best things about these purifiers is that they have very low operating costs. Filters are pretty cheap and energy consumption is super low. It’s a great purifier if you need something that you place near a wall, the intake and exhaust are positioned perfectly. It also offers a small footprint… about 21 by 7 inches. And, there are few purifiers that are as quiet as a Rabbit Air. So they’re great for TV rooms, nurseries, or you want it to run it in your bedroom on auto mode. Only offers 1.5 pounds of Activated Carbon… it will take a little longer to kill odor. The Rabbit Air features a BioGS HEPA filter, but that is neither the first nor the last step in the system’s filtration process. Most air purifiers have about three different filters. The MinusA2 has a total of six filtration steps. Before the HEPA filter, there is a pre-filter and a medium filter. Each removes smaller and smaller particles. This extends the life of every filter in the system. The BioGS HEPA filter reduces common allergens more efficiently than regular HEPA filters. These filters literally collect bacteria, viruses, and particles that feed them. Which is good because many good filters become breeding grounds for the bacteria and viruses they are meant to stop. The BioGS helps stop this growth in its tracks. After the HEPA filter, buyers can choose between four options. Each option is engineered to address a specific issue. A germ defense filter is the perfect choice for those with delicate health. The toxin absorbing filter keeps air clean in new homes and office environments. For allergy sufferers, there’s a pet allergy filter and pollen filter. The fourth option removes odor, which is great for anyone with odor problems; from farmhouses and crowded apartment buildings. An activated charcoal filter is the fifth filter. Typically, activated charcoal works to soaks up odors, and it would work even better when paired with the odor killing option as the fourth filter. Right after the carbon filter is the final step, a negative ion generator. This charges particles so they sink to the carpet rather than floating into your lungs. Rabbit Air designed these filters to be economical. Many families hesitate to buy air purifiers due to the high cost of replacement filters or fail to replace filters as often as they should in order to save money. The MinusA2’s filters last up to two years. By extending the life of the MinusA2’s filters, Rabbit Air makes their product a realistic option for more buyers. If the unit operates an average of twelve hours a day, then the yearly filter costs weigh in just over forty dollars per year. 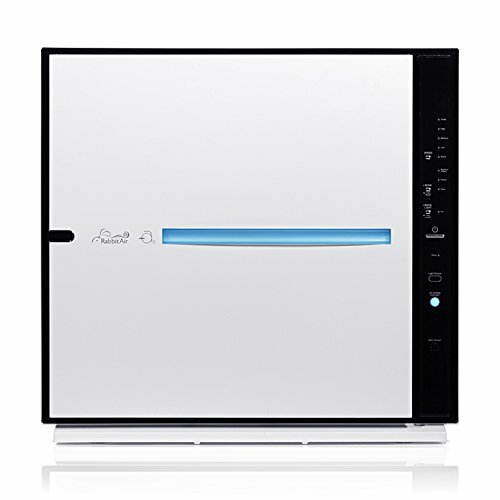 As Rabbit Air advertises these purifiers are made for rooms that measure between 700 and 800 square feet, approximately. But that’s at 2 air changes per hour. If you have light to moderate allergies you’ll want at least 4 air changes per hour so cut the 700-800 number in half. This is probably where 80 percent of purifier shoppers fall… light to medium use. That means that you’d really want to put this in a room that measures about 350-400 square feet for best results. If you’re a heavy user, however, this purifier will only cover about 250-300 square feet successfully. If that sounds like you we would urge you to give up a little in the size benefit of the Rabbit Air and opt for an AirMega. They’re just as good looking and feature-packed, the downside is that they’re pretty large compared to the sleek MinusA2 models. Another (less feature-rich) option that still looks great is the newer Blue Pure 121. It is pretty tall, but offers great performance at good price. We also like the way it looks… it’s even a little sleeker than the MinusA2 if you ask us. Air purifiers are, by and large, designed for function over fashion. Rabbit Air is working to change that trend. The company offers some of thier machines with classical and custom art on the front cover. These covers allow users to disguise their air purifiers with original Rabbit Air designs or copies of classic art. Some of the best works of Klimpt, Hokusai, and Van Gogh transform any unit from an eyesore into a piece of décor. Wall mount options help further disguise the air purifier. Although the unit weighs almost exactly twenty pounds, it comes with special instructions to help users hang it on the wall without ripping a hole in the drywall. The flat design helps the purifier blend in on end tables and mantels, too. The “trim levels” available in the MinusA2 line might seem a little confusing. But, when you break them down and take a minute you’ll see that it’s fairly straightforward. At least until you have to choose a customized filter or faceplate. This is the base model in the line. It covers slightly less space. However, it is quieter than the nex two models we’ll cover. The case is the same in size and general design, but options are more limited. It’s CADR rating is almost identical to the larger models, so unless you really, really need/want a feature offered by the larger versions… the 700A probably provides a better value. The 700A is only available in a white case, so if you want a black one you’ll need to splurge on a 780. The Artist faceplates are available on this model, as is the AAFA certified allergy and asthma model (with scent diffuser). We picked the 700A as one of our favorite purifiers for smokers. The 780 line provides you with a little more performance. Nothing crazy but it is a bit more powerful. The 780A also offers you the option of black or white when choosing a case. And like the 700 you can get a beautiful faceplate and the AAFA certified model. The minor downsides are more energy consumption and a little more noise. Both of which are unnoticeable to anyone not looking at a spec sheet. The major downside is the price jump over the 700A; expect to pay about 50 more dollars for a small performance gain. This is the model we’d probably choose if we wanted a MinusA2. Why? Because for an extra 20 bucks over the 780A you get a solid set of smart features. You can control the purifier from your phone, set timers, etc. Performance wise it’s the same as the 780A. It also offers the same colors and faceplate options. There are a ton of options available (not as many as Alen’s BreatheSmart Line) and they all work on the three variants (700A, 780A, and 780N). The navigation on Rabbit Air’s site may be a little confusing because it separates the purifiers into “classic” the artist series and the AAFA Certified line. However… it’s really just three variants, a choice of faceplates, and customizable filters. The MinusA2’s energy use has a lot to do with the setting you choose. The unit can use anywhere between seven and forty-seven watts. The motor is Energy Star rated. Light sensing and automatic modes schedule and adapt to changing environmental factors for energy savings. In light sensing mode, the unit turns off whenever the room goes dark, which is great for anyone disturbed by noise as they sleep. The intelligent automatic mode adjusts fan speed based on air quality. Rabbit Air stands behind its products, and customers have great coverage for the first several years of ownership. In addition to 24/7 customer service, the MinusA2 comes with a five year warranty. This goes well beyond a satisfaction guarantee. This warranty ensures your investment is protected. Paired with the great customer support, users can relax and enjoy their clean air. Users frequently praise their MinusA2. Many mention its power to combat serious allergies, and everyone enjoys its discrete appearance. Some users claim the MinusA2 is so quiet, they could only tell the unit was running by the feel of air flowing out the top. While a lot of automatic settings have gotten mixed reviews in recent years, Rabbit Air did extremely well with this model’s sensors. Previous buyers told stories of their units automatically turning on or shifting to a higher setting when smoke came from the kitchen, or when windows opened. Some users found the filters didn’t last as long as expected, but there are too many variables to determine whether that was the fault of extremely poor air quality or failed promises on the part of the manufacturer. The MinusA2 is not only a great Rabbit Air product, but it’s arguably one of the best air purifiers on the market. Although the upfront costs set this unit towards the higher end of the price scale, it’s designed to save money throughout its lifetime. The Energy Star rated motor uses less electricity, and the filters need infrequent replacements. What really sells this item is the customer sentiment. It’s rare to find so much praise across the board. Nothing tells potential buyers more about the value of a product than the experiences of similar users. Allergy sufferers have the most to gain from this second hand reporting, but the feedback proves the Rabbit Air MinusA2 is for everyone. It’s pretty simple to evaluate price and performance numbers on paper. However, seeing a purifiers true value is more complex. Here is our how we think the MinusA2 line scores in key areas (i.e. is it worth the money for…). Keep in mind these ratings are based on how the MinusA2 compares against its competitors; not just any purifier on the market.